My mom was telling me about this pressure cooker, pictured above. This is a FAGOR 3 in 1 Multi-cooker. She bought it from Amazon here. Chef Brad also recommends this Pressure Cooker because it is so versatile and has more functions. His review can be found here. 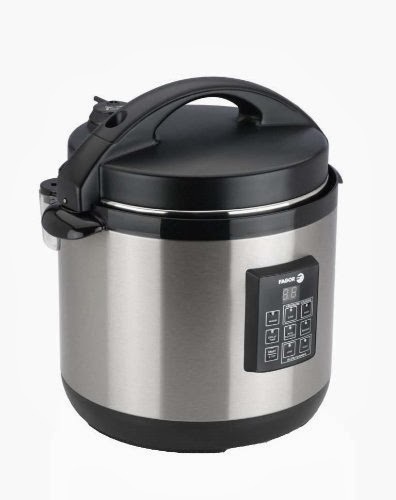 This particular pressure cooker works as a pressure cooker, rice cooker, and slow cooker. My mom has used the slow cooker function to make a one pot meal of beef roast and vegetables, and also the pressure cooker function to make split pea soup. If ever my pressure cooker should stop working, this will be the pressure cooker I get next. Oh my gosh I just melted when I read that it's also a rice cooker and slow cooker. If mine both die in the same week (ha ha) I'd get one of these too!